I absolutely love washi tape! And envelope are is so pretty (: These are great tips! I’ve had a few penpals over the years, but none recently, haha. The website you shared sounds like a great place to find new ones! These are some great ideas for me to send to my pen pal! Ooo, I loved the pin idea! Thanks so much! Yes penpals are really great! 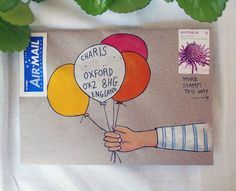 I think the idea of penpals is adorable! I have two pen pals, and I don’t write them nearly enough, but i think you inspired me!